One steamy, frozen chunk of Han… Solo! Here's Boba Fett with Jabba's favorite carbonite wall decoration! Limited edition statue from Star Wars Episode V: The Empire Strikes Back. That's one steamy chunk of Han! 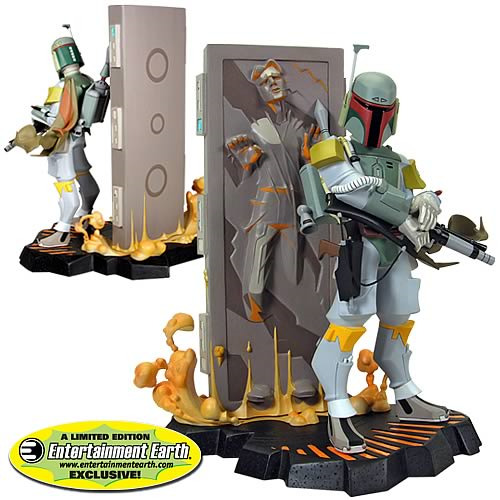 Inspired by events seen in The Empire Strikes Back, Boba Fett appears here in this roughly 10-inch tall animated style resin statue, standing in front of his trophy. The just-frozen Han Solo is stuck in his carbonite block, still steaming from the freezing process that took place just moments earlier. On his way to Jabba the Hutt, Boba is armed with his pistol, rifle, and super-powered suit of Mandalorian armor. This unique take on one of the most famous rivalries in the Star Wars saga presents everybody's favorite bounty hunter as the victor. While you may never be able to install a carbon freezing chamber in your own home, this spectacular sculpture will allow you to set up a small chunk of one on your shelf! Measures about 10-inches tall x 7 1/2-inches wide x 6 1/2-inches long. Limited edition of 1,750 pieces.